Wokingham has had two eights for over a century. Between them they have clocked up nearly 150 peals, but only once has anyone rung peals at both towers on the same day. That was 27 April 1912, with a band led by Alf Pulling from Guildford. 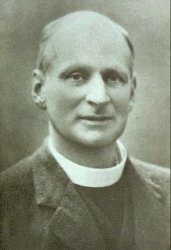 More significant locally was Revd CWO Jenkyn [right], Master of the ODG from 1910 until his sudden death in 1933, whose picture hangs to this day in All Saints Wokingham tower. The other ringers came from Reading, Caversham and Guildford. The idea of repeating the feat with a local band, began with a chance remark by Chris Cole, but it caught on and grew, as such ideas do. After several months of thinking about it, we had both a date and a band. There was a slight hiccough when one of the band dropped out, but fortunately we were able to call on Richard Johnston, who although not a resident in Wokingham, rings regularly at both towers, and is de facto an honorary local. We planned to make this a public event, so we ran an advance story in the Parish Magazines , contacted the local press, and put up posters round both towers explaining what we were doing. We hardly ever ring peals with the sound control open at All Saints, so this was a bold move, but on a Saturday morning, there is continual traffic noise near the church anyway. Timing was fairly tight, since we wanted a ‘proper’ lunch, and we had to be finished before a service at 5pm. We opted for ‘Yorkshire and score’, which was just as well, since we had an unplanned intrusion that nearly cost us the first peal. A press photographer (not from the paper we had been dealing with) claimed we had invited him, and persuaded one of the wardens to unlock the tower to let him in. Having him barge in and start taking pictures while we were ringing didn’t help anyone’s concentration, but we managed. After that, the sticky heat, and the odd blister seemed minor problems in comparison.